This could be the best video of a traffic stop that I’ve ever seen. First, you see this giant crab looking creature enter on the left side of the screen. He’s chillin’ on the curb, sizing up his prey. After :15 seconds, he appears to go in for the kill. At :21, good Lord this thing is huge as it gets closer and closer to the police officer. Thank goodness he doesn’t appear to see the monster that is seemingly about to eat him. I’m not sure I’d want to see that coming, either. It looks like a crab! Wait, no. It’s a spider. A really big one! :25 LOOK AT THIS GUY! He’s even licking his chops!!! :27 OH MY GOD, HE’S GETTING CLOSER! Oh. Never mind. 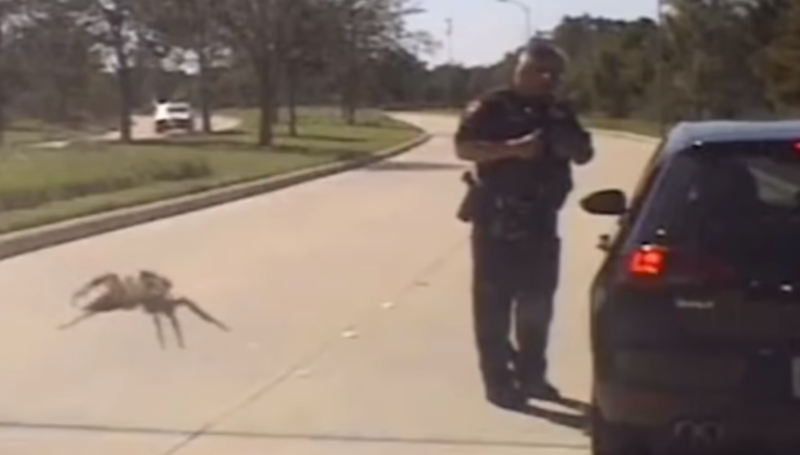 Turns out, the officer’s cruiser’s dashcam shot a small spider walking across his windshield. Phew!